Grassroots Enterprises - Brenda Herchmer Grassroots Enterprises - Article: What kind of Workplace Would Make Gumby Happy? What kind of Workplace Would Make Gumby Happy? This week I wrote a blog for a government website. To be honest, it made me a bit nervous. Unlike my typical writing where putting forward my own opinion is a given, in this particular case, I had to apply, pass scrutiny, and be given permission to blog. As a result, I felt a bit of pressure to behave. Clearly it was not the kind of workplace structure where a Gumby could flex, respond, and innovate. But the eye-opener for me was realizing there is a significant and growing disconnect between the open, flexible social networks we enjoy - and where Gumby would thrive - and the reality of the rigid structures and hierarchies of typical workplaces. In all fairness, vertical hierarchies, departments, and divisions made sense in an industrial, mechanistic world when it was all about efficiency. However, in today’s constantly changing world, vertical organizations are simply not as effective when the name of the game is respond, adapt, innovate, and, do it quickly. Today, we instead need to focus on building organizational structures that are more horizontal or flat than they are vertical with few or no levels for management between staff and managers. 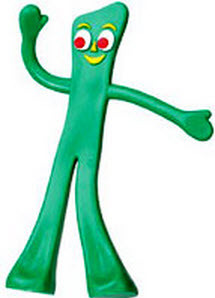 Gumby-thinking would suggest that horizontal organizations would promote empowered employees who are more productive because communication is improved, inefficient red tape is removed, unnecessary work is reduced, and the entire decision-making process is sped up. If Gumby had his way, I’m guessing he’d be happier with a workplace that organized around outcomes or functions, making teams rather than individuals the cornerstone of designing our organizations. That in turn would allow us to integrate more, decrease hierarchies by eliminating work that doesn’t add value, and give team members the authority to make decisions. There is no doubt that flexible Gumby would see the value of prioritizing a workplace culture of openness, cooperation, and collaboration that focused on ongoing growth and development and the empowerment of employees. While it would not be without its challenges, Gumby would be the first to admit that organizations, companies, and government need to become more horizontal than vertical if they are to respond to increasing demands for innovation and excellence. Next entry: Are You a Treasure Seeker or a Trash Collector? Previous entry: Does Simplicity Make the Complex Possible?